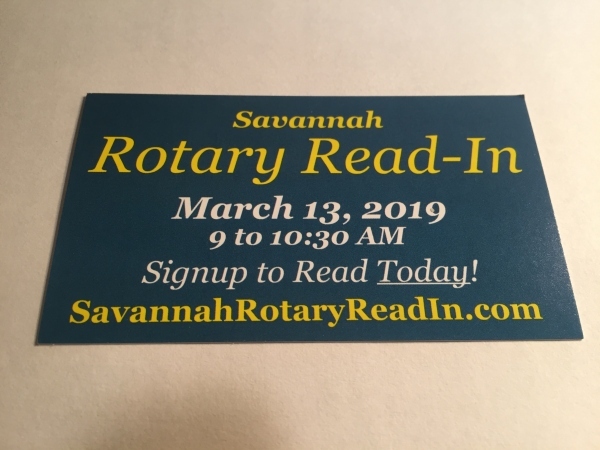 The Rotary Club of Savannah is searching for volunteers to serve as community readers for the second annual Savannah Rotary Read-In on Wed. March 13 2019. 9-10:30AM. The goal of the event is to promote literacy by encouraging the desire to read more. A report by the Annie E. Casey Foundation indicates children who aren’t reading at grade level by the end of third grade are four times as likely to drop out of high school. Read about the Read-In co-chair & Savannah public school advocate Frank Moore, Jr. in our Savannah Morning News column here. Last year’s inaugural event drew 526 volunteer readers who read to students in 566 classrooms. This year, Savannah-Chatham public schools plans to add pre-kindergarten to the list, which means rotarians and volunteers will read to students in 600 pre-k through third-grade classrooms in 32 schools. You don’t have to be a rotary member to participate. This entry was posted on Saturday, February 9th, 2019 at 10:02 am	and is filed under Development/Education, Outreach. You can follow any responses to this entry through the RSS 2.0 feed. Both comments and pings are currently closed.